In a tacky suburban chain motel, some of computer science’s shabbily dressed elite have come together for a computer chess tournament. The winner will face off against the arrogant human host, Pat Henderson, who has never lost a match to a machine—at least not yet. He and his opening night panel predict that will end by 1984, a year rife with significance. The defending champs from Cal Tech are still the presumed favorites, but their TSAR program is acting decidedly buggy. It is so bad that the project director, geek superstar Dr. Tom Schoesser, hastens his arrival for an emergency diagnostic session. Things seem to be going well for the MIT contingent, with Shelly Flintic receiving an inordinate amount of attention as the first woman team-member in the competition. In contrast, nobody wants to deal with the prickly, borderline homeless Michael Papageorge, even if he is a mad genius. Bujalski fully embraces the technology of the era, shooting “Chess” in black-and-white on now archaic late-1970s video cameras. The film is even rougher and grainier than viewers will expect, yet Bujalski’s nostalgic vision will win them over. Indeed, it is clear throughout the inspired first four-fifths of “Chess” that the game of chess is really just a stand-in for innumerable AI applications to come. We can also recognize Papageorge as one of the sort of social dropouts who either became the Bill Gateses of the world or more likely remained marginal figures, haunting tech clearance auctions and buying bizarre obsolete hardware to continue building their mad visions. Myles Paige arguably deserves award consideration as Papageorge, finding pathos in his obnoxious behavior. Texas-based film editor Robin Schwartz also gives “Chess” some soul as Flintic, one of the few competitors with any facility to make human connections. University of Chicago professor Gordon Kindlmann’s Schoesser has a knack for making his theory-heavy dialogue sound smart and accessible, while in his on-screen debut, film critic Gerald Peary chews the scenery nicely as the pompous Henderson. Considered one of the godfathers of mumblecore, Bujalski now demonstrates how handy it is to have some plot and an underlying concept supporting a film. Still, he overplays his hand in some respects. Initially, the hippie-dippy encounter group sharing the motel is a rather brilliant piece of era-appropriate cultural satire that could have been lifted from 1980s uber-zeitgeisty “Serial.” However, whenever Bujalski contrives ways for the two groups to intersect, the forced comedy falls flat. Likewise, the genre payoffs he offers late in the third act are head-scratchers that make little sense in the film’s overall context. Frankly, “Chess” works best when suggesting TSAR might just be the not-so-distant ancestor of Joshua in “WarGames” and HAL 9000 in “2001: A Space Odyssey.” Nonetheless, Bujalski presents a consistently compelling time capsule that captures the innocent fascination and single-minded commitment to innovation that drove the digital revolution. 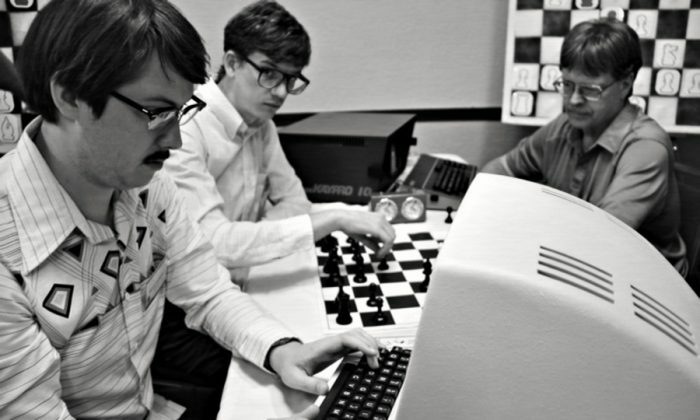 A sly period production with a keen understanding of early computing, “Computer Chess” is recommended for Wired readers.